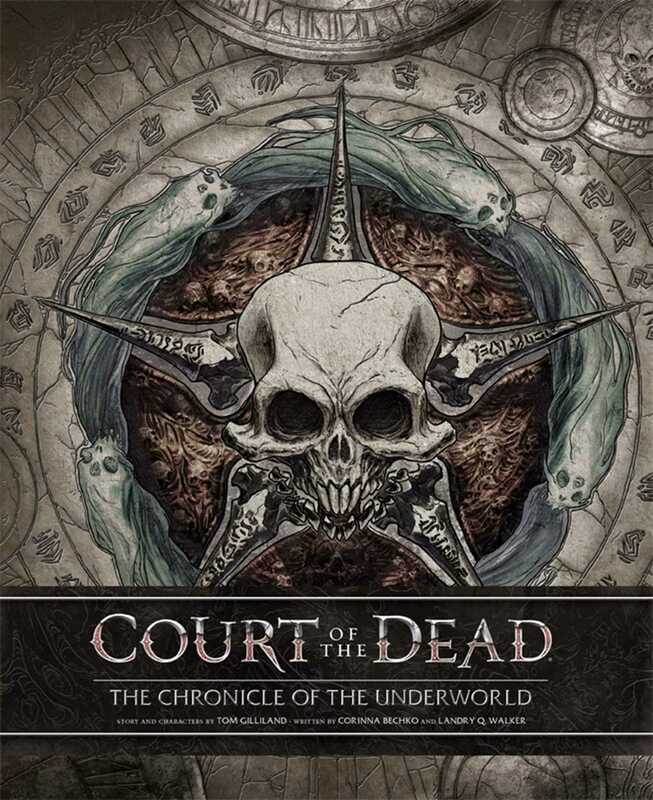 Delve into the dark and chilling history of the Underworld itself in this immersive companion to Sideshow Collectible’s hottest new property, Court of the Dead. In the sprawling citadels of the Underworld, deep within the vast libraries of Voxxingard, a curator sits. Staring at an empty tome, he ponders the puzzle that has been laid out before him by his Master, the shepherd of souls known as Death—a question deceptive in its simplicity, “What is the purpose of the realm of the dead?” To answer this, the curator must write a journal chronicling the rise of the Underworld and the history of the never-ending war of Heaven and Hell. From the lowest scavenger of corpses to the highest chancellor, all those within the Underworld must be questioned and examined. For what is the purpose of the land of the Dead? Is it a haven for the refugee spirits of the mortal world? A sinister part of the celestial war machine that threatens to consume reality itself? Or does it instead serve to bring true balance to the long abandoned promises of Heaven and Hell? Accompany Death’s curator on his strange journey as he unravels the most terrible and wonderful secrets found within the Court of the Dead. Landry Q. Walker is a popular American comic-book writer and creator best known for his all-ages comics, such as Red Lanterns, Teenage Mutant Ninja Turtles: Animated Adventures, Supergirl: Cosmic Adventures in the 8th Grade, and Batman: The Brave and the Bold. He lives in El Sobrante, CA. "In Sideshow’s new property, Court of the Dead, the underworld contains multitudes: processing station, de-militarized zone, bohemian art enclave. Here, the underworld was originally founded by Death as a buffer zone between Heaven and Hell, but is now on the path to becoming an independent, self-determined kingdom full of weirdos and misfits trying to find a place in the celestial cosmos outside of the eternal war between Heaven and Hell."